If you like dessert for breakfast, then this is the dish for you! OK, it’s not exactly dessert, but the way my family inhales this you might think that it was! Buttery, cinnamony (is that a word? ), gooey, pull apart, yumminess! Monkey Bread has been around for a while and this recipe is a semi-homemade, make the night before, easy recipe! 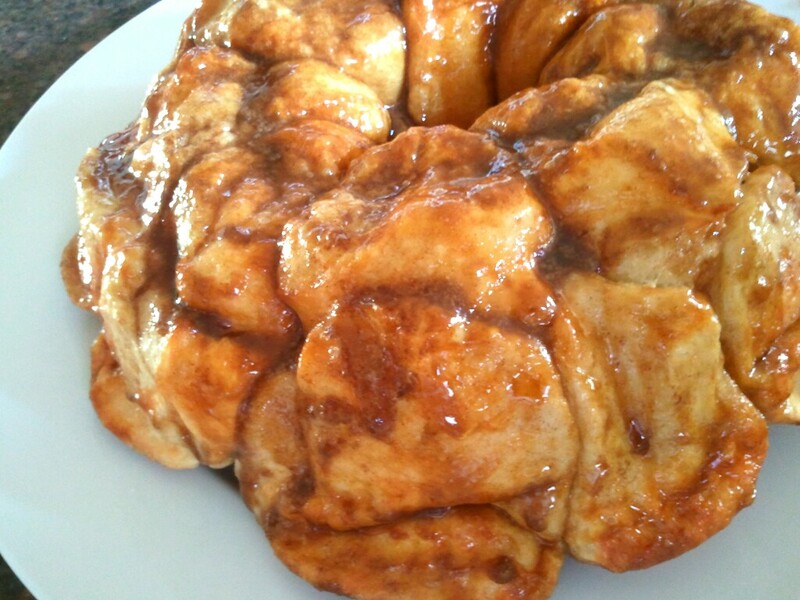 Plus, it has all the gooey goodness that monkey bread is famous for. The secret is adding the butterscotch pudding packet. Yes, pudding! I had my doubts at first too, but once I tried it I knew it was a must! The recipe is semi-homemade because I use Rhodes Frozen Dinner Rolls. (I can’t always be a rock star momma!) But, when I have the time I use Shannon’s Famous Roll Recipe. Both are delicious, one just takes a wee less time. Place the frozen dinner rolls in a greased bundt pan. Using only half the pudding packet, sprinkle over the rolls evenly. In a medium bowl combine melted butter, brown sugar, and cinnamon. Pour cinnamon mixture over the rolls. Place on counter uncovered overnight to rise. Get up before your kids and preheat oven to 350 degrees. Bake for 20-28 minutes, or until tops of rolls are a dark golden brown. Remove from oven. Place a large plate on top of the bundt pan and quickly flip so the bundt pan is now on top, upside down. Remove bundt pan and let monkey bread cool 5 minutes on plate before serving. This is a family favorite at our house, I make it with this recipe but throw some pecans at the bottom of the bundt pan before I put the rolls on top, YUMMY! we had these last weekend and they were delicious. I cannot wait until your book comes out!